TMS is a mind-body syndrome originally identified by Dr. John E. Sarno M.D. TMS stands for The Mind-Body Syndrome, or Tension Myositis Syndrome, meaning “pain in the muscles and nerves caused by inner tension.” More broadly it refers to ailments affecting all systems of the body, such as gastrointestinal symptoms, allergies, migraines, weakness, and many more —in addition to pain. Dr. Sarno discovered that pain and other symptoms act as a distraction to keep us from being aware of difficult emotions such as anger. His breakthrough treatment is an “education cure” that helps patients connect their physical symptoms to their emotional make-up, life stressors, and their childhood histories. Here is a more detailed description of TMS, including the classic personality traits that lead to TMS symptoms, and Dr. Sarno’s basic approach to treating it. 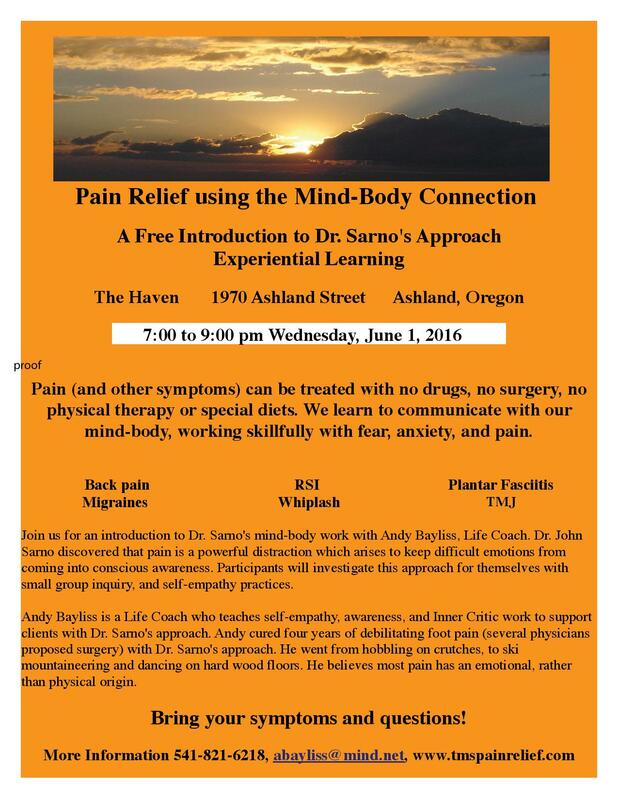 Andy coaches clients in applying Dr. Sarno’s treatment to end pain. The TMS Wiki has a wealth of free information put together by sufferers who have used Dr. Sarno’s approach to treat pain effectively. Disclaimer: Diagnosis of TMS cannot be made by Andy Bayliss. Correct diagnosis is possible by seeking a Physician trained in diagnosing TMS, (also check this list) or by working with your Physician. It is vitally important to rule out real systemic disease or structural abnormalities before proceeding to use mind-body approaches. This is the client’s responsibility.